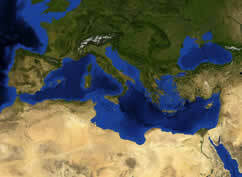 In 1975, 16 Mediterranean countries and the European Community adopted the Mediterranean Action Plan (MAP), the first-ever Regional Seas Programme under UNEP's umbrella. In 1995, the Action Plan for the Protection of the Marine Environment and the Sustainable Development of the Coastal Areas of the Mediterranean (MAP Phase II) was adopted by the Contracting Parties to replace the Mediterranean Action Plan of 1975. The Contracting Parties decide on MAP strategies, budget and programme in pursuit of MAP’s goal at their Ministerial level meetings, held every two years. They appoint Focal Points to review the progress of work and ensure the implementation of recommendations at the national level. A rotating Bureau of six representatives of the Contracting Parties guides and advises the MAP Secretariat (located in Athens) in the interim period between the biannual meetings. MAP’s activities are primarily financed by the Contracting Parties through their contributions to the Mediterranean Trust Fund. Other main sources of funding to support specific projects and activities include voluntary contributions from the European Union, UN agencies, and the Global Environment Facility (GEF). to limit and intervene promptly on oil pollution. Capacity-building measures to help neighbouring countries create national environmental administrations that are able to develop and police environmental laws. Using the Commission's Research budget to develop and share knowledge of environmental issues relevant to the Mediterranean. Developing indicators to monitor the success of Horizon 2020. The initiative is open to all stakeholders and calls for the mobilisation of the necessary financial resources and the provision of technical support from all partners. All stakeholders are invited to work together to maximise assistance, exploit opportunities and meet the commitments of the timetable. Prevention of and response to environmental damage from offshore exploration and exploitation activities is an issue to which the EU attaches a lot of importance. On 17 December 2012 the Council approved EU accession to the Offshore Protocol, thus underlining EU commitment to reducing environmental impacts of offshore activities in the Mediterranean through efficient regional cooperation. The legal consequence of this Council act is that the Offshore Protocol now becomes part of EU legislation. On 10 June 2013 the EU adopted a Directive on safety of offshore oil and gas operations. More detailed information about this project: offshore activities in the Mediterranean. A project managed by the UNEP/MAP Coordinating Unit and co-financed by the EU has been finalised, contributing substantially to the implementation of the Ecosystem Approach that the Contracting Parties of the Barcelona Convention (and among them the EU) have agreed to implement in the Mediterranean. The Ecosystem Approach is compatible with EU environment policies, in particular the EU Marine Strategy Framework Directive; the implementation of EU and broader Mediterranean policies for conservation and, where necessary, restoration, of the marine and coastal environment will be mutually supportive. In the framework of the Strategic Cooperation Agreement (SCA) between the European Commission and UNEP, a follow up project is being carried out. Under the same Agreement, UNEP/MAP has been awarded the overall coordination of the SWITCH Med policy programme to assist southern Mediterranean countries to further develop and implement sustainable patterns of consumption and production. Prevention of and response to environmental damage from offshore exploration and exploitation activities is an issue to which the EU attaches a lot of importance, as demonstrated by a number of policy documents, including the proposal for a regulation for safety of oil and gas offshore activities, currently under discussion in the EU institutions. On 17 December 2012 the Council approved EU accession to the Offshore Protocol, thus underlining EU commitment to reducing environmental impacts of offshore activities in the Mediterranean through efficient regional cooperation. The legal consequence of this Council act is that the Offshore Protocol now becomes part of EU legislation. 04/04/2012: A new Science for Environment Future Brief on offshore exploration and exploitation in the Mediterreanean is published. Read it here. 10/02/2012 Flyers on marine litter and offshore activities in the Med publised! 08-10/02/2012: The Conference of Parties of the Barcelona Convention met in Paris. More information here. 25/10/2011: The European Commission adopted a proposal for the EU to accede to a Protocol of the Barcelona Convention that protects the Mediterranean against pollution from offshore exploration and exploitation activities. Such activities are increasing in the Mediterranean, and the area is particularly vulnerable due to its semi-closed configuration and significant seismic activity. The "Offshore Protocol" covers a wide range of exploration and exploitation activities and touches upon permit requirements, the removal of abandoned or disused installations, the use and removal of harmful substances, and provisions on safety, contingency planning and monitoring. On 13 September 2010, the Council adopted the decision to ratify the ICZM Protocol to the Barcelona Convention. More information can be found here.